The Raspberry Pi Linux distribution I'm using is Adafruit's Occidentalis. It supports WiFi out of the box and appears easy to configure. But as noted by Adafruit, adding peripherals to the RPi may increase the loading on the power supply to your board and this, in turn, may affect the voltage presented to the RPi. This is clearly the case, even for the tiny OURlink WiFi (802.11b/g/n) USB Adapter (uses the RTl8192cu chip which is supported by Debian Linux) I purchased from Adafruit. When I plugged it into the RPi, it became unstable and crashed. Adafruit advises that you can over come this by attach the RPi's USB port to a powered hub. (Note that all USB hubs aren't powered or powered sufficient, and therefore, not all are recommended. I used a Dynex 4 Port Hub with a 5V 2.1A power adapter and all seem fine.) If you find using a using a USB hub completely unacceptable, you could make some RPi board modifications to the polyfuses, but this isn't the "official/supported" approach for this power problem .... but first .... see the Epilogue No. 1 below. I eventually got around to moving away from WEP to WPA2. See Epilogue No. 2 at the end of this page. To make things even more exciting, I changed the WiFi adapter to one that didn't have a currently installed drive on the RPi. See Epilogue No. 3 for the solution to this dilemma. No IP assigned ... now what? 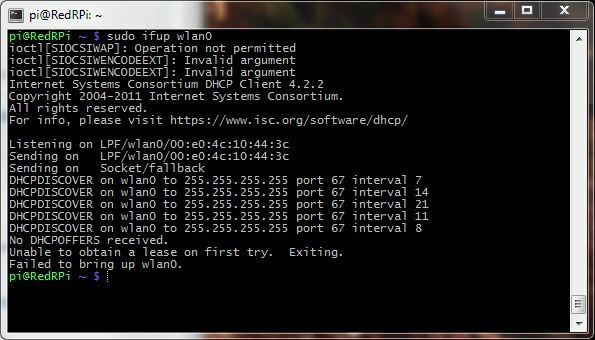 I then ran sudo ifup wlan0 to start the wireless networking (Note: you can use sudo ifdown wlan0 to turn-off the wireless network). This time DHCP discovery appeared to work. 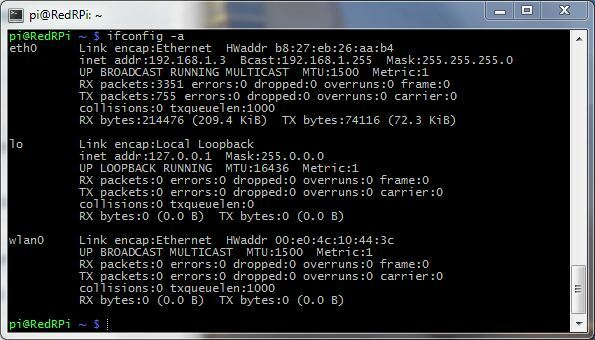 I then ran ifconfig -a giving me the display below with an assigned wireless IP. I cleaned out the ~/.ssh/known_hosts file on the PC from which I'm accessing the RPi (I'm using Cygwin with Openssh). 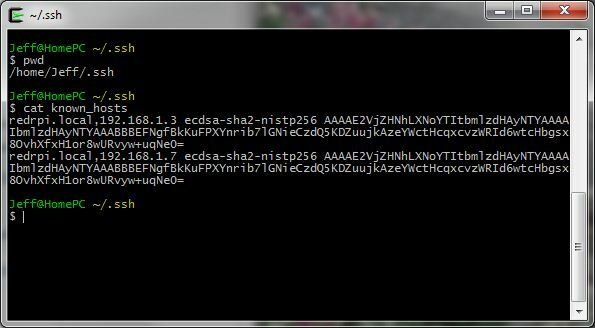 With the entries in the file removed ssh keys would need to be recreated on next login. I then logged into the RPi in via ssh -X pi@RedRPi.local. The login created an entry the ~/.ssh/known_hosts file on the PC. Using vi, I edited the ~/.ssh/known_hosts file. I duplicated the one existing record but changed the IP address to the wireless address. I restarted the openssh on the PC. (I terminated all the Cygwin window and restarted them. I could get anything else to work short of a PC reboot). I then logged in using ssh -X pi@192.168.1.7. Now I'm wireless!! I have found that if I don't use a USB powered hub and I plug in the OURlink WiFi (802.11b/g/n) USB Adapter while the RPi is up and running, the RPi will crash. The good news is that, once the RPi reboots, it runs fine without the powered hub. So, go ahead and use the WiFi USB Adapter, without the powered hub, but make sure the adapter is plugged in when you boot up .... problem solved! I eventually got around to improving the security on my WiFi network by moving to WPA2. This is a vast improvement over WEP, but not completely unbreakable. I followed the procedures outline in How to Setup Wi-Fi On Your Raspberry Pi via the Command Line. To get it running, execute the commands sudo ifdown wlan0 then sudo ifup wlan0. Note: To create the Hex version of the psk key from an ASCII passphrase, your can use the wpa_passphrase documented here. I had to swap out my OURlink WiFi (802.11b/g/n) USB adapter on the RPi for a new one and suddenly WiFi stopped working. This seem strange, since it was the same manufacture. I discovered, via the lsusb command, that the USB ID had changed for the adapter. This could imply that the chip set inside the adapter is also different. After much research, I discovered that the device drive had changed. I found the procedures for the fix in this article and downloaded the new compiled module driver for the kernel along with its companion firmware file, and added the module to the kernel. 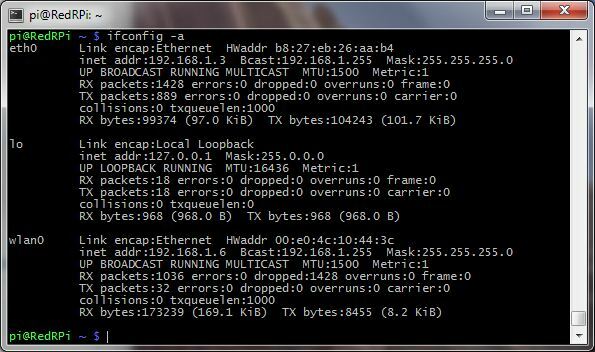 At that point, the WiFi adapter could be sensed by ifconfig but I still couldn't get it to work. A looked into the /etc/udev/rules.d/70-persistent-net.rules file for udev rules, and this showe that the adapter was assigned a new name. I reflected this new name in the /etc/network/interfaces file, and then everything worked fine.